We are new to the world of food blogging and are becoming increasingly amazed, day by day, at the riches it offers. We have "met" many wonderful people travelling through the food-blogosphere, stalking their blogs and drooling over the food they cook and create. Up until a month ago, we did not even know that blog events existed! Now that we have discovered them, we can de-lurk and come out from the blog-stalker shadows into the full light. One of the sunniest of these blog events, it seems, is in Florida: The Royal Food Joust (hosted by the Leftover Queen). When we heard that seafood, sesame, and cilantro are to be the ingredients for the August food joust, we immediately thought Chinese. 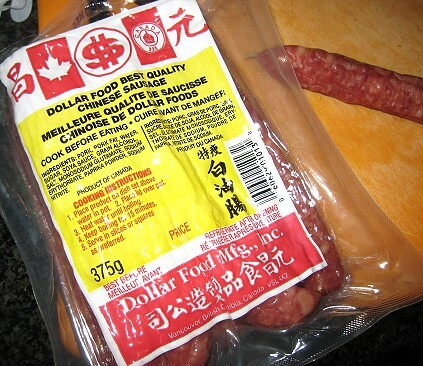 These ingredients are certainly staples in Chinese cooking (and more generally Asian cooking). We don't really cook Chinese food. That is, we don't cook Chinese food very well. We are unfamiliar with some of the techniques and the ingredients used in Chinese cookery. Add to the general unfamiliarity the language barrier of not reading and speaking Chinese (more or less) and we have almost given up on achieving even the basic competence in Chinese cooking. The joust ingredients were just begging to be made Chinese. In my words, they had "Chinese" written all over them!!! Thus, we persisted. See, we are also eternal optimists. Besides, there is the consolation that we are able to tell ourselves that our Chinese food does not turn out well because of equipment woes, not having the hot-hot-hot fire needed for wok-cooking. Now that our optimism is gushing forth like a geyser, for this joust, we even chose to go the dimsum route. Never mind the fact that we know next to nothing of the seemingly painstaking techniques dimsum chefs use to create their masterful little morsels. Thinking that dimsum recipes will be forever out of reach, we even gave away the lone cookbook in our collection with dimsum recipes just a few days prior to the conceptualization of our entry dish. That book had been collecting dust on our shelves for quite a number of years. For better or for worse, we present as our entry to the Royal Food Joust these three little morsels, our dimsum-inspired trio. Our goal was to have each dimsum morsel self-sufficient. That is, that each already contain all of the joust ingredients in itself. The plan was that the three had to complement each other, yet be able to stand on their own. Taken individually, each is fairly easy to do and the recipes are fairly straightforward and uncomplicated. One of my favourite dimsum items, although it is a tad dated now and I don't see the dish on dimsum tables anymore in Vancouver, is "shrimp toast". 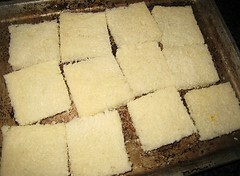 I loved gobbling these: there is something about fried bread that was irresistible. This was simply a matter of making the shrimp/prawn paste and spreading it on bread, then "toasting" them in some hot oil. The prawn paste had cilantro and sesame oil. 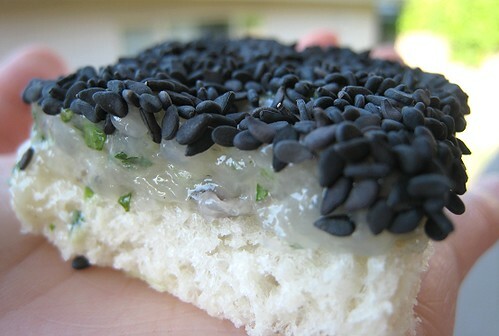 We also coated the top with black sesame seeds for extra flavor and crunch. This mixture smelled so good even before we cooked it! In fact, these prawn toasts were quite beautiful pre-frying. 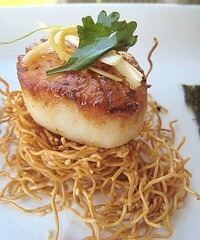 The next item is scallop on a bed of stir-fried chow-mein noodles. The noodles were stir-fried in a little sesame oil, soy sauce and more sesame seeds (this time, white sesame seeds). For the scallop preparation, we were inspired by the classic Chinese steamed fish. After steaming, the fish is garnished with ginger slices, green onions and cilantro. Then, very hot oil is poured over the top. Our scallops were quickly seared and garnished with slivers of ginger, green onion and cilantro. We heated some sesame oil and soy sauce, then spooned that over the top. Our last item is loosely inspired by sushi. For the seaweed portion, we simply brushed a piece of nori with sesame oil and used it as a "placemat", if you will. The rice portion is quite delicious and very Chinese. 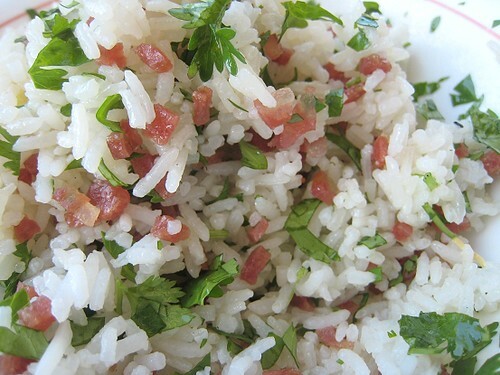 We sautéed some finely-diced lap cheung (Chinese sausage), then mixed in cilantro, sesame oil and cooked white rice. To make the wonton cups, I brushed both sides of wonton wrappers with oil and baked them in small glasses (as we didn't have a mini muffin pan). The seafood component is bright orange masago on top, dotted with black sesame seeds. The masago was indeed very bright! Very neon! I was almost blinded going through pictures of it. 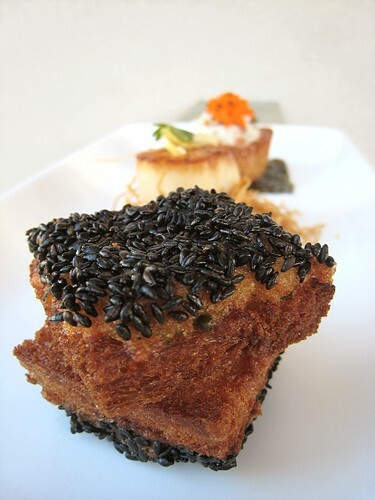 The black sesame-studded masago topped each rice-filled wonton cup. Again, each dish was not too difficult to do. But of course, please feel free to make them as a trio as well. If you wish to participate in the Royal Food Joust, or to vote for us (teehee), please visit the Leftover Queen's Forum for all the info. Mix shrimp/prawns, egg white, cilantro, cornstarch, rice wine, ginger, salt, sesame oil and white pepper in a food processor. Purée until mixture is smooth. Cut off the crusts of the bread. 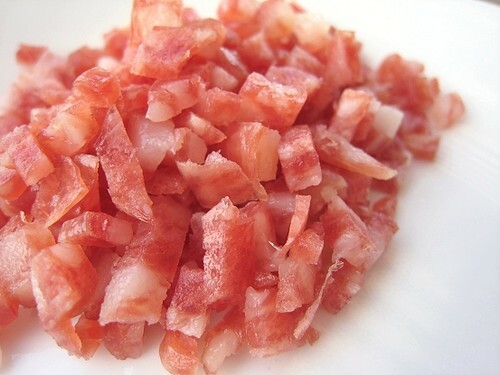 Cut each slice into 4 pieces. Put black sesame seeds in a small shallow bowl. For each piece of toast, spread about a tablespoon of shrimp paste on one side, making sure the paste is level. 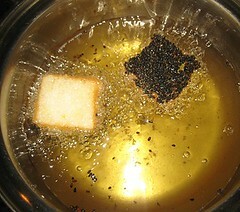 Then place the toast, shrimp paste side down, into the black sesame seeds to coat. Heat oil in deep pan or small pot over medium (not high) heat. There should be at least 2 inches of oil. Test the oil with some scraps of bread. It shouldn't brown too quickly. Place a shrimp toast, shrimp paste side down, in the oil. Cook for about 1 minute, until the edges of the toast start to brown. Turn over and cook for another minute. Remove from the oil and place on paper towels to drain. Repeat with remaining toasts. Bring water to a boil. Add chow mein noodles and cook until done, about 1-2 minutes. Drain. In a sauté pan, heat sesame oil. Add noodles, soy sauce and sesame seeds, stirring until well tossed and hot. Set aside. 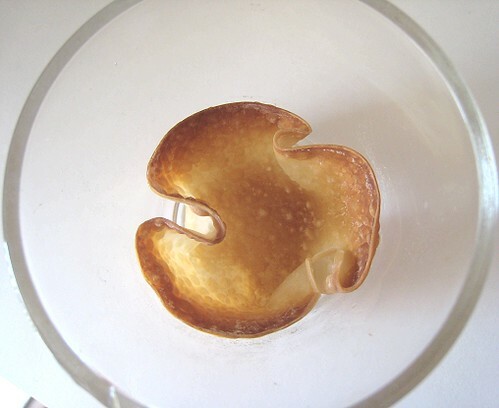 Pat each scallop dry on both sides. 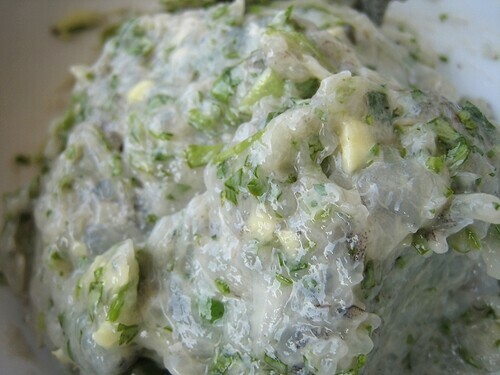 In a small pan, heat vegetable oil or butter. When hot, sear scallops on one side until golden brown, approximately 2 minutes depending on the size of the scallops. Flip over and sear the second side. Place on paper towels. Make 6 chow mein nests. Place a scallop in each. 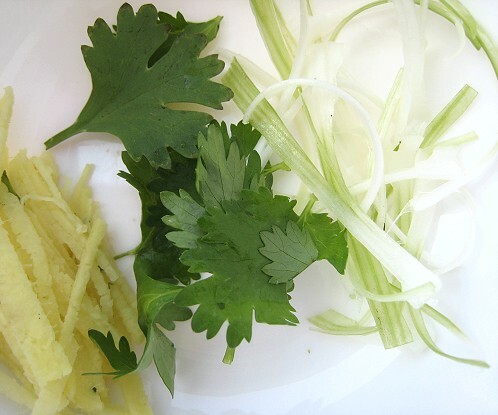 In a small bowl, combine ginger, green onions and cilantro. Garnish each scallop with the aromatics. In a small pot, heat sesame oil and soy sauce. When hot, spoon over each scallop in nest. Heat oven to 375 degrees. Brush both sides of wonton wrapper with oil and place each in mini-muffin pan, making a cup shape. 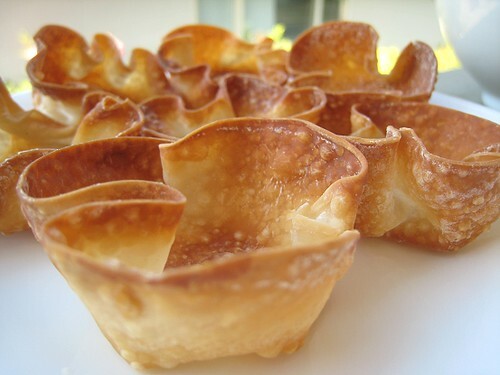 Bake until wonton cups are golden brown and crisp, approximately 7-12 minutes. Take out of pan and set aside. In a small dry pan (no oil), add diced lap cheung and turn on the heat. When they start to render, add white rice, cilantro and sesame oil. 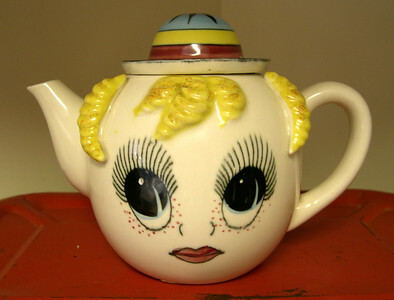 Toss until heated. 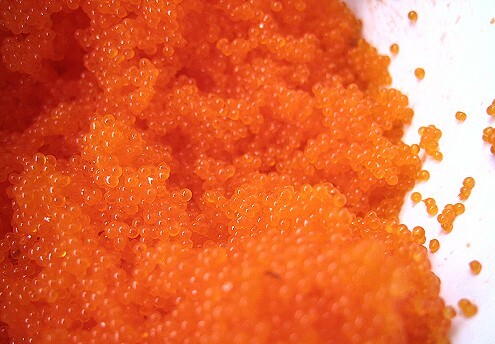 In a small bowl, mix masago and black sesame seeds. Cut nori into 2.5" x 2.5" squares. Brush each nori sheet with sesame oil. 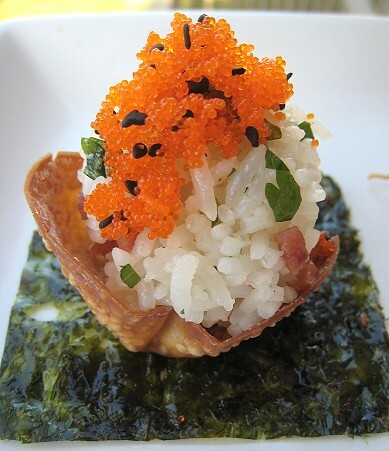 Fill each wonton cup with the rice mixture, then top with masago & black sesame seeds. Place each wonton cup on a nori sheet. This is our entry to the Royal Food Joust (created by The Leftover Queen). Caribbean "Fish & (Banana) Chips"
Wow so yummy looking. I wish you ladies open a restaurant so you can showcase these gems. I'll be there eating everyday. yum, i think they look delicious! i love dim sum. great job! i always fell from my chair. 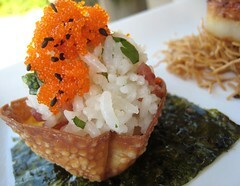 ;this is the most good looking entry for the food joust..you will definitely have my vote!! You did a great job! I find the prawn toast particulary fascinating. Gotta try that someday. Like peter pointed-out, it looks like a tasting you would get at a fancy restaurant. Niice!! Their very unique, looks yummie! Those look absolutely amazing! Top notch presentation! I really like the sound of that prawn toast. Holy crap, you guys are amazing! Such a terrific combination! I really like the trio idea too. Oh, puhleeeeze! You are both obviously Chinese chefs!! I couldn't make something like this if you offered me a million dollars! Got here through Lasang Pinoy Sundays. Love your photos. OMG - you totally nailed this. This looked soooo good. One day I'll be on this level...yup, one day! just like what i said in the forum...this is so iron chef-ie awesome! count my vote too! welcome to the food blog event world - you have made quite an effort to produce this meal! What absolutely beautiful food. I've got this bookmarked so I can decide where I'm going to start. Fabulous! You've outdone yourself. I can't imagine you not winning this contest. Great job! Im so envious that you created this stunning Dim Sum! It takes my breath away. I do love shrimp toat and you took it up a noth.Funny I just cooked for the first time with that sausage today. I like! Oh my gosh. These are amazing! I could only hope to be so creative, and take such great photos. You two are amazing! So yummy! prawn, and scallop! Wow! I'd definitely vote for you! Looks so nice.. Definitely looks like find dining fare. You guys are awesome. I mean, for not doing Chinese well, those look pretty darn good. What an amazing trio! Each one is more beautiful than the next! Just lovely! I love the look of all of those black sesames. I am getting cupcake idea here! You guys think you don't know Chinese ingredients well? Wow I would hate to see the stuff you are confident in! Amazing work! Your photos are absolutely stunning! Everything looks so tasty. 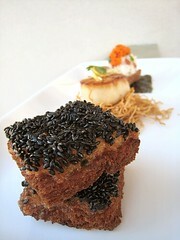 What an imaginative interpretation of shrimp toast! Yum! Thanks! This brought back memories of making little FUSSY hors d'oeuvres-y things for customers! Haha. A restaurant is too hard! Haha. The prawn toast turned out remarkably simple to make... We were a bit hesitant about that one at first, just because we are deep-fry averse. Although, we only did 12 toasts. I'm thinking we wouldn't be so happy doing a large volume, hehe. Nice. Glad you liked it. For a quick meal, sometimes we don't even bother with the "stir-frying" part: we just sliced them up and add it to the rice cooker as the rice cooks. No effort at all! Ooh, cupcake idea, you say? You have to show us what you make! Glad to have found your blog too! Wow ladies, I am so impressed. Not only with this post (which is jaw-dropping. This is the sort of thing that folks pay BIG bucks for in cities' fanciest restaurants), but I've been cruising your blog for a bit now and I'm really, really impressed. And your back and forth banter is so fun! I'm adding you to my google reader, and will be back. Keep it up! 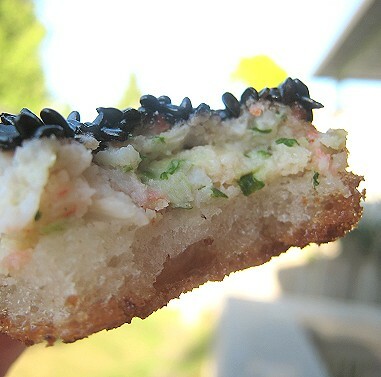 Yum, fried shrimp toast, I'm sure it must have been created in SOUTHERN China. All three of these recipes are elegant yet so doable. I am already trying to dream up a dipping sauce for the scallop one, perhaps a kaffir lime/coriander/ vegetable stock reduction and maybe a soupcon of heat. Changing the subject from asian to european, Michel Richard of Citronelle, uses dim sum wrappers for making ravioli. I've tried it once and other possibilities keep running around my brain. Any suggestions? Another thing that happens in Chinese dishes is cutting the rappers into small strips and deep frying them... then adding them to dishes for texture. Wow wow wow! Your trio is simply beautiful! Well done! I think you should open a restaurant.